School has officially started here and all three of my kiddos are going this year (cue the Hallelujah chorus). After what seemed like an extremely long summer, this means that I finally have time to, well, have a cup of coffee, complete a thought, go to the bathroom without having to stop a fight or answer a question mid-pee and - my favorite - read! I did manage to whiz through a few parenting books over the summer. I found myself becoming much more of a yeller and threatener than I'd ever planned to be -- and none of it was working -- so I knew it was time to change my plan of attack. I read The Explosive Child first, hoping to find some immediate relief with my very explosive five year old. I didn't get that, but I did come away with a few new ideas. Love & Logic was next on my list, which really changed my whole approach. In some ways, it built on concepts in The Explosive Child, like working with the child to come up with solutions to problems and disagreements. I also really appreciate the concept of logical consequences instead of just yelling the first threat you can think of. For example, on the way to the library yesterday, my 5 year old was terrorizing his brother. When I asked him to stop he didn't and when I asked him to come and talk to me about it, he refused. Normally I would have taken away the first thing that came to mind. Instead, I used the L&L technique of telling him that I was really upset and I'd have to take some time to think about the consequence for his action. When we arrived at the library, I knew what that consequence was: he was not allowed to pick out a movie like his brother and sister because that was a privilege for children who are kind to their siblings and parents. I didn't think another book could come close to having the impact that Love & Logic did, but How to Talk So Kids Will Listen and Listen So Kids Will Talk was fantastic. 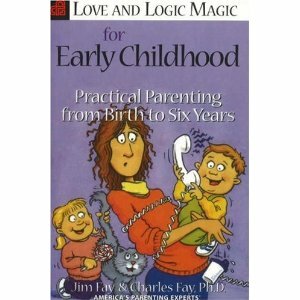 Many of the principals were the same, only How to Talk doesn't use time-outs, which were used (in a way) in Love & Logic. I'd recommend this book to every parent whether you have a difficult child or an angel because it's filled with great insight on how our choice of words affect our children. 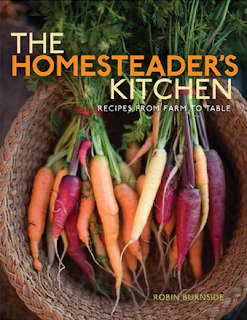 In The Homesteader's Kitchen, author Robin Burnside presents wholesome recipes and motherly advice for preparing nourishing meals, tasty embellishments, and luscious desserts. Her focus is on using fruits and vegetables from the family garden or the nearby farmers market. 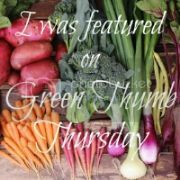 She teaches how to turn these local, organic foods into snacks, meals, and treats that nourish the soul as well as the body. From Multigrain Blueberry Pancakes in the morning, a Creamy Mango-Coconut Smoothie for a snack, a crisp Asian Cabbage Salad for lunch, an evening meal of Grilled Wild Salmon Fillet with Thai Cilantro Pesto, to a dessert of Spicy Pear Pie, Burnside offers mouthwatering recipes that are fun to prepare and a joy to eat. The author introduces this cookbook in a way that recognizes the connection between body, mind, emotions, environment, and attitude. Since what we eat has a considerable effect on our well-being, this approach to dining takes into account all that goes into the care of feeding humans, including the benefits and consequences of our choices. As consumers, the foods we buy, where they come from, and how we prepare what we purchase must be considered if we are to create a sustainable future for generations to come. In her debut cookbook, Jennifer Schaertl tackles the myths about gourmet cooking (you don't need expensive cutlery and a gazillion ingredients!) and shows you how to make delectable meals despite the lack of counter space. Everything from appetizers and salads to soups and one-pot wonders to side dishes and entrees, and of course, dessert is included along with Jennifer's tried-and-true advice for working with limited space, appliances, cookware, and ingredients all on a limited budget. River House is one young woman’s story about returning home to her family’s ranch and, with the help of her father, building a log house on the property. Sarahlee Lawrence grew up in remote central Oregon and spent her days dreaming about leaving her small town for world adventures. An avid river rafter through adolescence, by the age of twenty-one, Lawrence had rafted some of the most dangerous rivers of the world as an accomplished river guide. But living her dream as guide and advocate, riding and cleaning the arteries of the world, led her back to the place she least expected — to her dusty beginnings and her family’s home. River House is a beautiful story about a daughter’s return and her relationship with her father, whom she enlists to help brave the cold winter and build a log house by hand. As nurturers and caretakers of the health of our children and communities, women have the power and ability to transform the way we eat and farm. 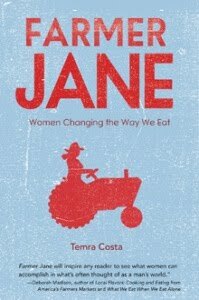 Farmer Jane profiles twenty-six women in the sustainable food industry who are working toward a more holistic food system in America a system that ensures our health with wholesome natural foods, protects the earth and wildlife, treats farm workers fairly, and stimulates local economies. I'm also about 2/3 of the way through Everything I Want to Do Is Illegal: War Stories From the Local Food Front, by Joel Salatin. It's quite the interesting, yet sometimes frustrating, read. I'll be sure to put up a review soon! 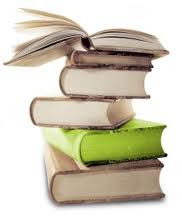 What are you reading these days? What's on your list? I'm still stuck on Big Box Swindle. I pretty much agree with the author's point, but it's getting to me how biased she is. I'm stuck on the last couple chapters and am having trouble motivating myself to read the rest. I really liked the How to Listen book you mentioned. What's hard is remembering to use their techniques instead of reverting to yelling! But what's funny is that my younger daughter says - you're using that parenting technique on me, I can tell by your voice! - but it works anyway, even though she knows I'm using it. I just finished No Impact Man. Voluntary Simplicity by Duane Elgin is next on my list. I read Everything I Want To Do Is Illegal last year and really enjoyed it. @Erin~ That's *exactly* how I'm feeling about Everything I Want to Do Is Illegal"
@JAM~ I got that from my 3 year old yesterday who said "I don't want you to say that to me mommy!" @Melissa~ I still haven't read No Impact Man. I need to go put that on my library list right now! "Better Off" by Eric Brende, recently finished "Plenty" by Alisa Smith and J.B. Mackinnon, which I really enjoyed since we are trying to eat as local as we can. For those interested in "No Impact Man", I see the documentary is scheduled to be on Planet Green this Saturday evening. "How to talk...." is a classic. I read it many years ago and still have a copy. "Love and Logic" is excellent; I use Love and Logic in my teaching. It's effective because it helps me stay calm and teach my students to put the responsibility on themselves for their behavior.